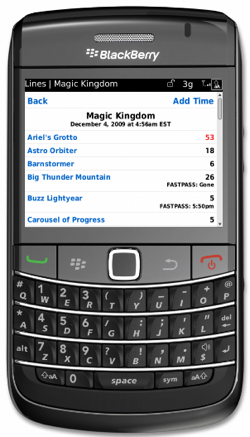 We’re excited to announce BlackBerry support today for Lines, our new mobile website that estimates current and future wait times for Walt Disney World attractions. Two weeks ago we launched Lines for the iPhone (a few days later, support for Android and Palm Pre) and we’ve seen amazing usage so far in the parks. BlackBerry seemed like the next logic platform to focus on (and by far the most requested), so we’re eager to get it into your hands. Over the past couple of weeks we’ve been furiously updating the models to improve our wait time estimates. We want to say thank you to everyone for trying out Lines during this beta period–we’ve gotten a lot of great feedback, a flood of data from the parks, and some great coverage. And if you’re a fan, we’d love if you could help spread the word! Lines is currently in beta and is free for a limited time–so sign up for an account and visit http://m.touringplans.com to give it a whirl! UPDATE:: Lines has graduated Beta and is now a fully featured member of the TouringPlans.com product suite! Read more here. Cool! Congrats on the launch! Looks great on my BB Curve! Can’t wait to use it in 6 days when we arrive at WDW. Sweet–thanks Mike! We can’t wait for you to use it either! I am so excited that I can now use this on my Storm!!! You all rock and can’t wait to officially try it out come marathon weekend! 🙂 You’ve made me a happy girl today! Woohoo! By the way, have you checked out the Be Our Guest Podcast? It’s fantastic! THANK YOU….checking out wait times on my Blackberry….how cool is that! Thanks Ellie! Eager to hear any feedback you may have. The fact that we were able to add Palm, Android and BlackBerry support so soon after the iPhone also validates the design approach we took with the app. Well done! Thanks for your patience! We’re working on it. But congratulations on getting the next system up and running so fast!! Nokia is the most common phone in the US, I believe. But I’m not sure their web browser is anything you’d want to write for. It looks great. Thank you very much for adding BB. Thank you so much. It looks great on my BB Storm !! I can’t wait to use it next week !! Thanks again ! Fabulous, thanks Chris! Have a great trip next week! Also, just letting you know that Len, Fred and I will be in the parks Dec 10-15th… hope to see you around! Fantastic! Looks great on the Tour. And I’ll be using it @WDW in two weeks. But the tiny screen gives you guys less exposure/advertising space. Phone skinz decals maybe? Hah! That would be a great idea. Glad it looks good on the Tour! Eager to hear any feedback you may have. Have a great trip! 1) When they will run out? 2) When they currently tell people to return? Hey Joey, on the main page, the FASTPASS time is our estimate of what it is currently distributing for. So “1:00pm” means that if you were standing outside the FASTPASS booth right now, that’s when you could return with your FP to ride the attraction. Of course, it’s only an estimate, but we’re making it more accurate every day. If you click through to the next page, you’ll see an estimate of when the FP will be gone by. Hope this helps! Thanks for the questions, we’ll try to make it more clear. This is a great point. Knowing now what it is we mean, how would you describe it? It is a challenge trying to make things clear with a limited number of characters. I think “Fastpass Return Time” or “FastPass Return” would do it for me. I might also suggest using an acronym like “FPRT” (FastPass Return Time) and describing any necessary abbreviations at the bottom of the page or in a small help section. One unrelated commented. When using my Tour, I have to login every time I access the page. Is there a way to prevent this (e.g. a “remember me” cookie or some such)? Can you ping me at henry@touringplans.com if you’re still having trouble? And thanks for the feedback re: FASTPASS. One confusing note to add to this discussion is that outside each attraction, the “FASTPASS Return Time” is actually the current time of day. Sweet. I played around a lot with that model in the simulator. Looks reall great on my Bold… Can’t wait to use it next week. When do you think you might have something up and running for a motorola Q ???? Sorry for the super delayed response. Can’t give ya a timeline on when we’ll support the Q. But we want to support it somehow soon. This looks fantastic on my storm, guys! I’ll be using it later this month. Thanks VERY MUCH for getting BB in place so fast! Thanks Robert–have you returned, and what do you think? I’m quite pleased with the infraomtoin in this one. TY! so simple!! Congrats, cant wait to use it in February. Thanks Irene! Our estimates have improved a lot since early December, so you should have even a better experience now. I am currently using a t mobile shadow. any chance to have this on my phone? it runs windows mobile and the full web browser. I logged into the site but then can not see any of the information then again I could just be missing it. Windows Mobile is next up. Sorry for the delay. Thanks Jeff! I’d expect us to be out of beta by May. You’ll have plenty of time to decide whether it’s worth a subscription between now and then. The Q is Windows Mobile, right? I have a BB storm, but can’t seem to get Lines to work. Does it support all storms or just the newer ones? I’ll be at WDW next week. Is there anything specific you’d like to test out? Or that I should pay close attention to? Looking forward to trying out the app. Thanks for your work on this project. Sorry for the delayed response… how did you enjoy Lines? As I posted in the other thread about 3 weeks ago, Windows Mobile users can get in using a detour, as I have had Lines running for almost 3 weeks now. I am a complete smartphone newbie, but it took me less than an hour after learning it worked on Safari. All I did was get Iris Browser 1.1.9 (may work with other versions) from RapidShare (the official download no longer exists). Judging from the WinMo response here, I’m guessing either few knew of this method, or it’s not working for others. Excellent workaround for now. Thanks for the bump, Dave. What about Winodws Mobile Devices???????? Thanks for your interest–we’re working on it. I’ll take your numerous question marks as indication that you _really_ want to try it out. I just started using the site on my blackberry, in preparation for a February trip. A quick question…I can’t get it to look as “neat” and nice as the picture you have does…all the text doesn’t line up and its all jumbly. Is there something, like a setting perhaps, that I need to adjust to fix that? It looks great on my computer, and I’d love for it to work like that on the phone! If you’re still have issues, ping me at henry@touringplans.com. Sorry for the delayed response. Tried Iris browser for Windows Mobile and it worked fine. As this is just a website, not a native application, the limitation for Windows Mobile not working is purely a choice by the management of touringplans. Windows Mobile would work if they would just not explicitly exclude it by checking the browser / OS version. It might not work on Pocket IE (or not until the latest release of PIE), but I’ll bet it would work on Opera right now. Come on touringplans, open this up for testing. I’ll volunteer to give you feedback. Sorry for the delayed response (I’m really in your doghouse right now!). You’re right that it is just a user-agent toggle. I hope you’ll understand that we want to provide the best experience possible to each platform. Also, when we support a new platform, we need to make the commitment to not only support it initially, but for as long as Lines is around. And so once Len and I get to that point, we’ll wave the WinMo flag. Hi there, just signed up to the site as I am off to Orlando late March. I have a Blackberry Edge 8310 with software version v4.50.55 but… when I go to m.touringplans.com I just get the information page with screenshots etc..
Am I doing something obviously wrong or is my Blackberry not currently supported ? Hey Spencer, just sent ya an email. Sorry that you’re having trouble. Unfortunately Lines is a mobile website, so you can’t actually download it, just access it like any other website. Not sure where we’ll be in February, so it may still be free or it may be premium by then! Thanks for your interest in Lines! I tried accessing Lines via my BB Curve, but when typing in my user ID and password, it simply returns me to the sign-on screen. Any thoughts? Sorry for the super delayed response–still having trouble? Email me. Is there any way you could add a java-enabled version for Blackberry? The Opera Mobile browser is webkit enabled and seems like it could handle it. Keep up the great work, what a fantastic app. Is usage of this app going to be a part of the Touringplans.com subscription? If so, awesome. If not, it’s worth paying for. Opera Mobile should be handling it better now. And yes, Lines is part of the premium TouringPlans.com subscription! Just tried it on my Samsung Impression and it finally works for me!!! Not as pretty as the screenshots but it is functional! I will definitely be using this in the parks next weekend and will be happy to provide feedback for you on how it works on this browser. Thanks for an awesome product-excited to use it at last. Just booked a June trip, and I am testing this program on my LG Versa (sort of a “smart phone,” but not that smart). It looks great! Just like the screen shots. I have no idea what browser my phone uses, but I’m just glad it works. I can’t wait to put it to real use in June! Great! Thanks Paula! Hope you have a great trip! Thanks- this is the best I have found for my phone!